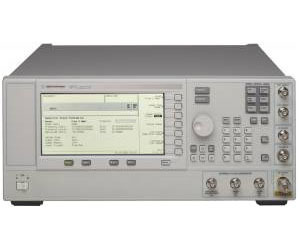 Providing premium performance at an affordable price, the E8257C PSG analog signal generator delivers industry-leading output power, superior level accuracy, low phase noise, and precision analog modulation for accurate characterization of RF and microwave components and devices. It typically eliminates the need of an external amplifier for testing high power devices and minimizes test uncertainty to identify errors early in the design process and reduce development time. The PSG sets a new price performance mark by providing advanced capabilities; including narrow pulses for radar test applications and ramp sweep for continuous sweep measurements and fully automated use with the Agilent 8757D scalar network analyzer. Customize the PSG for RF and microwave test applications ranging from LO substitution and simple distortion test to general-purpose troubleshooting and transceiver design verification. A variety of optional performance enhancements and accessories are available. Its modular architecture makes it easy to configure the PSG to address your specific test application, providing the level of performance you need today and the option to upgrade in the future.